For those of you who occasionally check out my What Mandy Thinks blog, you may know my sister and I aren't exactly besties. We have our moments but we're so different and distant it's tough to keep up one of those strong sisterly bonds most sisters I know have. (I've admitted I'm to blame in this post, in fact.) Regardless, there's plenty of sisters who have it worse than us so I'm proud and lucky to have her in my life. This sister I'm babbling on about took an art class in high school like both the daughters of an artist would naturally do. 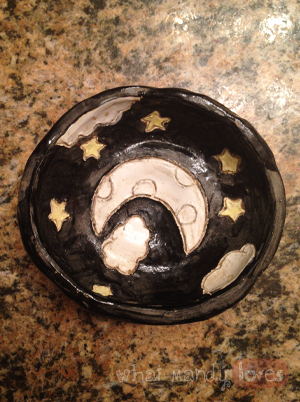 One project she did was a set of little ceramic bowls representing the day with clouds and blue skies, and the night with the moon and stars. My fuzzy brain at the moment of typing this post believes she meant to give one to my mom and one to me, but that's probably exaggerated since the words were more like "you can have this if you want." 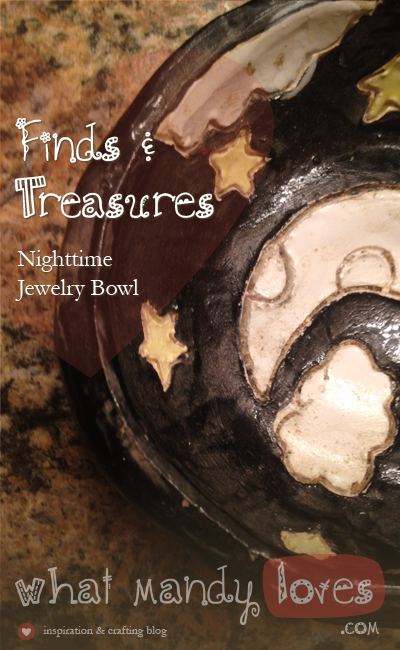 Ever since, I've used this cute little bowl that is slightly larger than my palm to hold rings, bracelets, and other jewelry I wear daily. Whether it was made for me or not, it was made by my sister and that's all that matters. Where do you keep your daily jewelry? Have you received any handmade gifts from your siblings? Let me know in the comments.